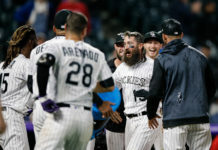 After consecutive rainouts to start the week, the Colorado Rockies and Arizona Diamondbacks were finally able to squeeze out a doubleheader on Wednesday in Denver. 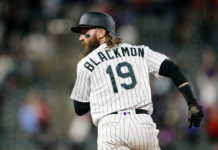 By the end of the day, the Rockies probably wished the rain would have poured again at 20th and Blake as the Diamondbacks easily swept the double header without either contest being competitive. The nosediving Rockies have now lost a season-long seven straight ball games – all to divisional opponents. Arizona ripped off 31 hits and five stolen bases on the day. Corey Dickerson’s plantar fascia appeared to flare up on him on a triple in the eighth inning of the first game of the doubleheader. Weiss took the left fielder out of the lineup for the second game. Tyler Matzek (2-1) struggled with control issues early and the D’Backs ripped off 19 hits as they beat the Rockies 13-7 in the first game of the day. Matzek allowed four earned runs and walked a career-high six batters in just two innings of work. The lefty’s strike percentage was just 39.2 percent on his 58 pitches. The 13 runs were a season high for Arizona. Aaron Hill went 4-for-5 with a three-run homerun and four RBIs in the game. Mark Trumbo continued his assault of the Rockies with a two-run jack, a double, and three RBIs. Trumbo now has two homeruns and eight RBIs on nine hits in only four games against Colorado this season. Collmenter (3-3) gave up three homeruns and five earned runs, but made it seven innings without walking a batter in the win. Ender Inciarte saved his starter twice with catches on deep balls against the outfield wall. Inciarte also had four hits and two RBIs in the contest. Nick Hundley improved his hit streak to a career-high 10 games with a homerun and a double in the losing effort. Justin Morneau and Drew Stubbs also homered for the Rockies. 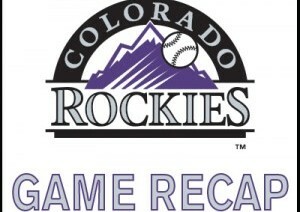 Despite the loss, the Rockies scored at least seven runs for just the second time this season. Devon Peralta’s two-out, two-run double in the fifth inning broke a tie and gave the Diamondbacks a lead that they wouldn’t relinquish as they won the second game 5-1. Paul Goldschmidt – the reigning NL player of the week – shook off a hitless first game with a homerun and an RBI single. Jordan Lyles (2-3) went seven innings and looked solid, but an ugly fifth inning in which he allowed three runs cost him a quality start. The 24-year-old allowed four runs on nine hits with six strikeouts and one walk. Robbie Ray (1-0) was impressive in his 2015 debut as the Dbacks 26th man. The lefty allowed five hits and one run in six innings. He was returned to AAA following the game. Walt Weiss was kicked out of the game in the third inning for arguing with the umpire about the strike zone. Along with Dickerson, Carlos Gonzalez was given the night game off. For complete coverage of the Rockies.